Q: When did you first get into using Steadicam? There were only about 10 UK Steadicam operators when I started, and very few that owned a rig. It was a massive investment for me as a young cameraman. The reason I did it was very simply that I found myself in this unusual position of doing both film and video work. I enjoyed working in both drama and in television. At the time, being a freelance cameraman that could work between film and television, one day I was on a film, might be 16mm, might be 35mm, next day Im flying a video camera; Steadicam appealed as a tool I could use in either mode to extend my production values. Being able to slip between the two genres was the key to my whole career; and Im still doing that now; nothings changed except that the film camera is often a digital cinematography camera now. I was quite surprised in that the Steadicam began to earn its money back relatively quickly; having your own kit was a big advantage in that early rigs needed very careful balancing and tuning, and that is much easier with your own rig which soon becomes an extension of yourself. Also because you own the rig you can be flexible on client rates when you need to be. Q: Has Steadicam changed, and does it still need that fine balancing to produce the shots? Earlier on it was more clunky, you needed tools, you needed allen keys; now you dont need any tools to balance, and there are quick release catches and everything just fits better and is more precise. 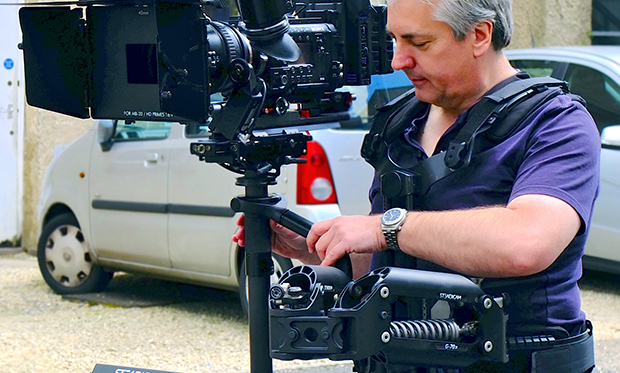 Steadicam still does now what it did then, but we are now in the 7th generation so improvements in all areas have been ongoing, with input from users, new technology and innovation, resulting in the new Steadicam M-1 rig available from the end of May 2015. The M stands for modular. This is the first truly modular Steadicam. You can start out by upgrading part of your current rig then upgrade to the full rig later. Ive got a Shadow, which has been a beautiful rig, but Im going to upgrade now to the M-1. The M-1 doesnt look that much different but it feels a lot more different because of the technology thats gone into it; the bearings, the way the gimbal operates, its all new; and those internal differences of engineering perfection, which is effectively what the thing is, the money isnt on the outside of Steadicam, the moneys on how it works on the inside - its the engineering, the precision; its how it feels, its how it behaves. Q: Would you say there have there been any truly major advances? Steadicam splits into three sections, youve got the vest, the arm and the sled, the bit that holds the camera and the monitor; each one of those has developed in different ways. There has been a huge leap in the vest technology, and that has come from a Steadicam operator, Chris Fawcett, who came up with what he calls the Fawcett Exovest¢. The Steadicam vest has always been an exo-skeletal device think Tom Cruise Edge of Tomorrow. But although the classic Steadicam vests have enabled the operator to get all those amazing shots, it has held the operator rigid to an extent but limiting movement in some directions and restricting breathing when totally engaged in getting the shot. This was less energy efficient and so Chris Fawcett applied his knowledge of human anatomy and came up with the wonderful Exovest. Its also exo-skeletal, It doesnt look that different, in fact it looks considerably smaller and thinner. But it enables me to walk properly; I can move my hips - it doesnt rigidise my body; its lighter it gets rid of the centre pads; it only touches me where I need the weight to touch me thats a huge improvement. It means I dont get so hot, it means I can breathe, my lungs can expand fully. The other vests, they have hip pads, midriff pads and shoulder pads, thats where it touches you. The Exovest gets rid if the middle pads - you dont need them. Also there are rigid bars on the front and back which connect with the top and the bottom of the vest. That doesnt sound like a big improvement, but its an enormous improvement because the old vests werent connected. Q: From what youve said, the Steadicam consists of three parts, so if I want to go out and buy a new M-1, one possible configuration would be to buy it with the Exovest in place of the standard vest? That would be the way Id recommend it. You could buy it with the standard vest, theres not a huge price difference, but I think its an utter no brainer. Its one of the biggest leaps in technology from an operators point of view, bearing in mind, it doesnt affect the pictures - to the producer, its exactly the same, but to the operator ... at the end of the day, are you going to crawl back to your hotel, or are you going down to the club and bop with the younger members of the crew? OK, I dont do that but you know what Im saying. Q: Is there anything left to say? Another big leap forward is you can actually walk sideways with it; the Exovest pivots ever so slightly, which means as you walk, your hips move from one side to the other; the vest accommodates that pivot, which means you can do a walk sideways; you can do a crab shot. Now there are other ways to do the shot, but all that gives you more flexibility how you move around the person or the object that youre shooting; so you dont have to do the funny cameraman walk - you can just walk utterly normally. It gives me longer on the Steadicam. My shots are identical; but it gives me much more energy and I move in a slightly different way; I dont waste energy while Im moving. Thats why at 50 I would hope Ive got 5 or 10 years in me whereas without the Exovest I would have hung my spurs up by now. David Crute joined the BBC in 1983 as a camera assistant. He left in 1989 as a full lighting cameraman and set up his own company. At around this time he became one of the first UK Steadicam operators and is now established in the ranks of the top operators working in this field today. His company Rock Steadi has continued to work for the BBC and all the major broadcasters including ITV and SKY and David has hundreds of commercial, drama and corporate credits to his name as Director of Photography. He has just finished shooting Monsoon Tide, a new film which will soon be on release and which was shot largely on location in India.